We use 30amp Housing as Standard, although 15, 30 and 45 are available. For years hams have used “Molex” connectors as a standard to connect their radios and other equipment to power sources. 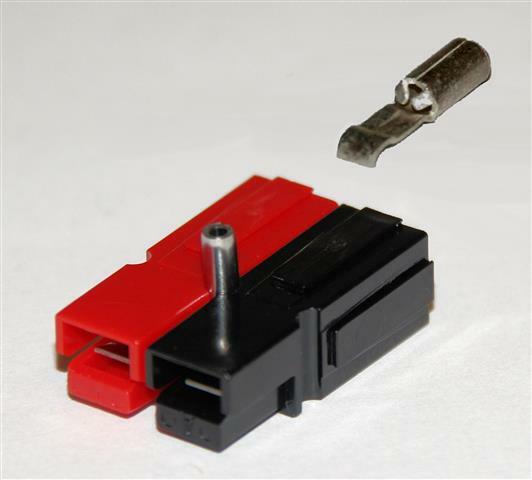 The Molex connector had the drawback of being limited to about 10 amps, and were often used well beyond their ratings. RACES and ARES organizations have now standardized on the Anderson Powerpole® for DC power connections. They offer the advantage of handling 15, 30 or 45 amps using the same connector (the contact must be matched to the current load). They are also genderless, meaning the supply and load connectors are the same, reducing the number of part required (but be careful you don’t connect two different supplies!). Either the 15-ampere or 30-ampere sizes may be used, and both sizes mate with each other. The 30A connector is preferred as it is compatible with both. The plastic housings are the same for both sizes. The barrel area (which holds the wire) of the 15-amp silver-plated contact is smaller than that of the 30-amp contact, but the contact area is the same. The connectors dovetail together into a compact unit. Housings should be mated according to the diagram above, viewing from the contact side (opposite the wire side), tongue down, hood up, RED on the LEFT, BLACK on the RIGHT. Use of a roll pin have found to have disadvantages since they may fall out as the the plug is twisted. Better may be the use of a dab of super-glue between the two halves. This also allows a clamp to be use to hold two plugs together. Highly conductive silver-plated copper contacts allow minimal contact resistance at high currents. Self-wiping action on make and break keeps conducting surfaces clean. Contact dents keep connectors mated in high-vibration applications and provide quick-break, snap action upon disconnect. Non-corrosive stainless-steel leaf springs maintain constant contact pressure — ideal for frequent connect/disconnect cycles and intermittent overloading. Durable, high impact-resistant, polycarbonate housing with UL94V-2 flammability ratings comes in many colors for circuit traceability and coding. Identical connector halves are genderless, making assembly quick and easy and reducing the number of parts stocked. Molded-in dovetails allow for a customized harness in a variety of configurations. When the connectors are disconnected, no metal parts are exposed. The 15-ampere contacts are designed for 16-20 AWG wire and the 30-ampere contacts are designed for 12-16 AWG wire. The contacts can be soldered or crimped to wires. An expensive crimping tool is available from Anderson (#1351G1, cost > $150). Inexpensive crimpers (costing about $20 at major home centers or online) can be substituted, however. After a contact has been attached to a wire, it should be installed into the housing so that the housing spring mates with the underside of the contact. To remove a contact from the housing, use Anderson insertion/extraction tool #111038G2. You may also substitute a very small blade (e.g., a jeweler’s screwdriver) to depress the spring, allowing the contact to be removed. Kits, as the one shown (Red & Black shells, two contacts, and ¼” roll pin) are available from a number of vendors. The housings cost less than 50 cents each, and the contacts cost less than 30 cents each (2002 prices, Allied Electronics). Kits can be purchased online, typically priced at $10 for 10, $20 for 25 sets. Make sure your kit comes with the roll pins (used to keep the red and black housings from separating). The connectors can be panel mounted with clamp receptacles, consisting of two aluminum plates (Anderson part #1462G1), notched to hold the plastic housings when they are dovetailed together. The plastic housings come in other colors also. Red and black are suggested for standard DC connectors (red as positive and black as negative). The housings have mating channels on all four sides, permitting 3, 4, or more contacts in one housing. However edited for local use.